And I’m feeling great. I just got in a very nice 9 mile run this morning. I started back up with a nice 4 miler on Thursday, upped that to 6 yesterday. The weather has been fantastic around here albeit a bit warm for running. Anything above 70 and I’m dying. But, the mornings have still been cool and comfortable. 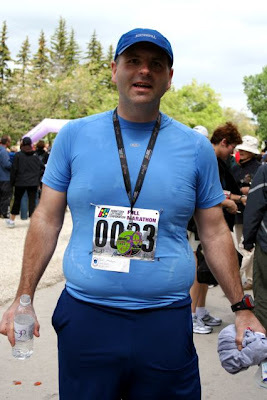 I’m really trying to cut my weight before the Twin Cities marathon in October. I have been very good about my eating over the last week and didn’t drink any wine during the week. I’ve lost at least four pounds this week in a combination of water and fat. I couldn’t have asked for a more perfect race. Everything about it was fantastic. I felt great, the weather was ideal and I ran the best I ever have. It must be that Manitoba Magic. 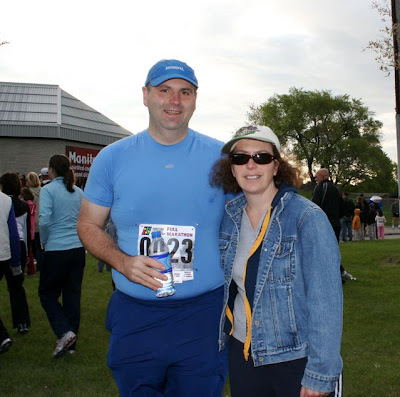 Last year on father’s day I ran the half marathon in Winnipeg and got my half PR of 1:47:31. The magic was back with me in 2008 for the full. I smashed, and I mean really smashed, my PR from Fargo last month by more than 20 minutes! I have been flying above cloud nine ever since. Friday we spent a leisurely day driving up to Winnipeg. I actually drove slowly keeping my speed under 60 mph. As a result I got about 25% better gas mileage than if I was driving my normal 80 all the way. Over the course of the trip this would work out to an extra 100 miles worth of gas I saved. Anyway, more about my hypermiling exploits later. Let’s talk about the weekend. We arrived a little after 5:00 pm and decided to just relax in the hotel. We got some take out and hung out in the room. Got to bed by 10:00 pm. Saturday morning we got up and had breakfast in the hotel. About 10:30 we drove out to the University of Manitoba to pick up my bib. Much nicer pick up location than where it was last year out by the airport. The only lame thing about this marathon is the expo. There just wasn’t much there. Very small. But it was ok. We got through every booth in about 10 minutes. The other thing on our agenda for Saturday was to tour the Royal Canadian Mint. We spent a few hours wandering around and enjoying a coin show that was going on at the mint. Lunch was a grilled smokie from the lunch cart. Pretty tasty, actually. Later in the afternoon we spent a couple hours in the hotel pool. Around 5:30 we headed over to Mona Lisa for dinner. This is an Italian restaurant in Winnipeg with a great reputation and it lived up to it. I had a pasta dish with chicken and a cream sauce that was out of this world. Early dinner and in bed by 9:00 was my plan and I stuck to it. Sunday – Race day – 4:15 am I get out of bed. I ate my usual leftover pasta for breakfast along with some coffee and water. 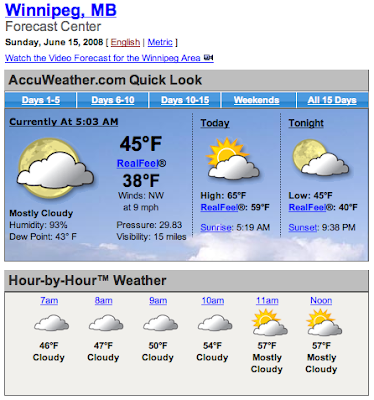 I checked the weather forecast and it was ideal – forecast for clouds and cool temperatures. It started at about 45 degrees at 5:00 am and rose to about 55 by the end of the race. The rain that had been looming on the horizon was going to hold off it looked like. At 5:30 we headed out the door to the University for the race start. On the way we were greeted with a double rainbow over the finish line full of promises of a great day. Before the race started I was antsy, as usual. Lots of people were milling around and I had to go to the bathroom three times before the race started. Lines were not too long. I always get pre-race bladder shrinkage for some reason. Other than that I was feeling really good and was getting pretty excited to start the race. The sun was making a bit of an appearance through the clouds off and on. It was about 47 degrees with a very refreshing breeze. 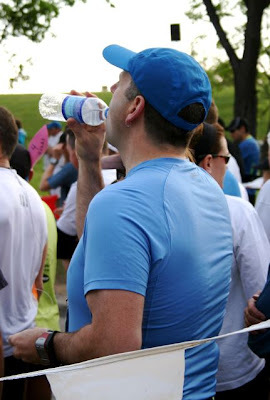 One last drink of water before the race started and I was ready to go. At 6:45 the national anthem was sung. I kind of like Oh Canada. It sounds pretty good in French too. The wheelchair racers got off at 6:55 and then we were next. The start was on a divided street so they were able to load up two roads full of people. This actually was pretty nice as it wasn’t quite as crowded as some other races I’ve been in. 7:00 am and the gun goes off. Remembering my dismal failure in Fargo after starting out too fast I took it conservatively at the beginning. My goal was for a 4:15 race but I still have that ultimate sub-4 bouncing around in the back of my head. So I started out with a plan to go out at about a 9:30 pace for a few miles then speed it up to around 9:00 or better, depending on how I was feeling. 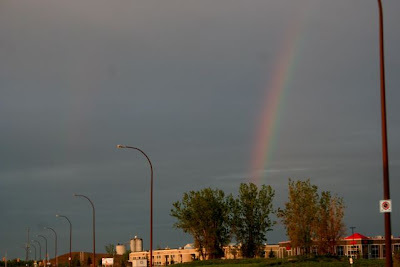 We started north on University Crescent Drive for one mile out to Pembina Highway. Right at the intersection there was a group of Japanese drummers that were just terrific. I hit the one mile mark at 9:23 – right on plan. Just before mile 2 we turned off of Pembina highway into a park along the river. Another 9:34 mile right on target. By this time I was looking for a porta potty for that darn small bladder. They were all taken so at about 2.5 I jumped into the woods. I still managed to eek out a 9:29 mile for mile 3 even with the pit stop. The next several miles were through some wonderful neighborhoods along the Red River. I was feeling terrific and ramped it up averaging about a 9:00 pace plus or minus 10 seconds. Back out onto Pembina Highway for a short stretch between miles 6 and 7. Just before the 7 mile mark we split off from the half marathoners and headed northwest along Harrow Street. I took my first Gu at the 7 mile aid station. 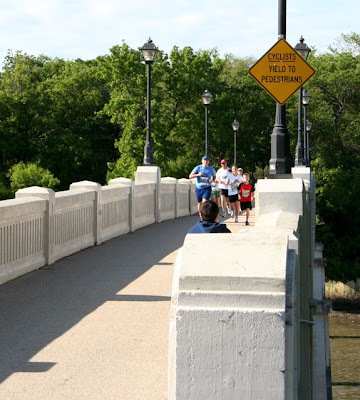 Another very pretty section of the race was miles 8-12 on Wellington Crescent road along the Assiniboine river. We were going west to Assiniboine park to cross the river on the foot bridge. The street was lined with wonderful stately homes. There were some mats placed around 11.75 miles that I thought were in a strange location. The official results show the “first half” time but the mats were no where near the half way point. In any case my official “first half” was 1:48:32. 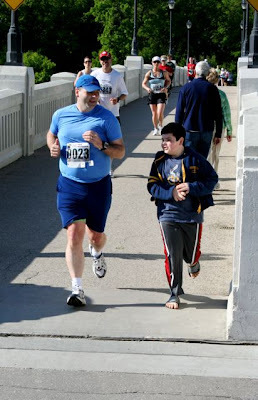 The highlight of my race (besides the finish) was meeting my son on the foot bridge. He ran across part of it with me which was absolutely fantastic. I was still feeling great and I told my wife as I passed that I was going fast and would be quicker than I anticipated. I guess she didn’t hear me but more about that later. After the foot bridge we turned east on Portage Avenue on the north side of Assiniboine river. At the half way point in the race I was thinking about how horrible I was feeling by this time in the Fargo race. I was completely out of energy and trying to figure out how I would finish the race. Night and day compared to here and now even though my half way time was just about spot on the same as it was in Fargo, about 2:01. I downed another Gu at the half although I was feeling no pain and felt stronger than ever. I didn’t mention it before but I was also taking in lots of fluids and gatorade at all the aid stations. A mile or so after the half way point we turned off of Portage Toward the river. Between Miles 16 and 17 we passed in front of the government buildings downtown which was quite nice. The weather was still a mix of some sun and mostly clouds. We turned back south after crossing over to the east side of the Red river. I was managing to maintain a 9:00 pace more or less all the way through mile 18. I hadn’t felt any fatigue or pain until now, but it was a good pain. I could tell my hips were taking a pounding but I was doing ok. Certainly fatigue was happening and it showed up in my time a bit but for the rest of the race I held a good 9:30 pace throughout. Somewhere around mile 20 or so a race official on a bike asked me how I was doing. I wonder if I was getting too focussed and looked out of it? I don’t think so. Anyway, I told him I was doing terrific. He asked me what my goal was and I said it was 4:15 but that I was going to do better than that. He said I was way ahead of that and was on pace for a 4:08. That really pumped me up! By mile 23 I was feeling the effects of the distance but there still was no wall for me to hit. I only briefly walked at two previous aid stations but I did take a few extra seconds at mile 23 which showed up in a 9:52 mile. Never the less, I was still fighting on. I approached Bishop Grandin Blvd and mile 24 thinking how wonderful it was to be running this race. I noticed that I was beginning to pass a lot of people. Even on the uphill side of the ramp I was going strong. Back onto University Crescent toward the stadium for the finish. That mile is called Irv’s mile in memory of a long time Winnipeg running supporter. It was so sweet to be running Irv’s mile still full of energy. I felt invincible. I was able to push out a 9:15 mile for Irv. Mile 26 and only 2 tenths to go. I was flying in at a faster pace than I had run the whole race. Just after I crossed the identifier mats at the entrance to the stadium I heard them announce my name. I swear I heard people cheering my name in the stands, but that was probably in my head. I was completely ecstatic when I crossed the finish line at 4:06:10. What a race! I couldn’t believe how much I have improved in just one month. I grabbed some water and a banana and headed out to find my family. They were no where to be found. I walked through the stands and around the stadium to see if they were still watching for me to come in. But I didn’t find them. So, I hung out near the runners exit. About a half hour later they showed up. They were expecting me at 11:15 but I had come in early. To top it off they had gotten lost on the drive down, so were late. They missed the finish, but that’s ok. As long as they were there to drive me back to the hotel. I definitely learned lessons from the Fargo marathon and it paid off big time here in Winnipeg. I ran a smart race and didn’t get carried away at the beginning. The other thing I did was make sure to drink plenty of water and gatorade along the way. Here are the splits recorded by my garmin. I noticed an ever increasing difference in my mile laps and the course miles. By the end my garmin was about a half mile ahead. Never the less it shows how consistent I was running this race. I am more motivated than ever now to finish losing the excess pounds. 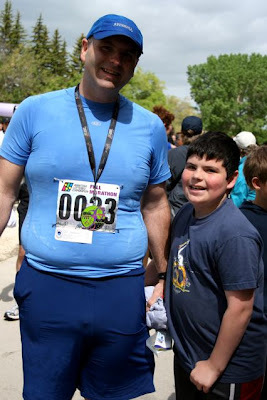 I can only imagine how much better I’ll run the Twin Cities in October with 30 pounds gone. It’s 5 am and I’ve been up for about 45 minutes. It looks like the weather will be perfect for a race today. Overcast skies, cool temperatures and the rain will hold off making for a nice day. I’ve already eaten leftover pasta for breakfast. I’ll start getting dressed here in a few minutes and head on over to the University of Manitoba around 5:30. I’ll see you on the other side. Have you ever had one of those runs where you just didn’t feel like you were connected to it? Like you were in another place and the run was just happening? That happened to me this morning. I went out for a nice 5.8 mile run this morning. It was a gorgeous morning with the sun streaming through the trees and a cool breeze blowing to take the edge off the humid air. Should have been perfect. But as I was running I just didn’t feel like I was connected to my body. It was going through the motions just fine but it was like someone else’s body. It kind of reminds me of Jill Bolte Taylor’s description of her mind going to la la land while she was having a stroke. One of the strangest runs I’ve had in a while. Hopefully tomorrow will be better. Well, I haven’t posted since the marathon and I wanted to update you all on my training. It’s only one more week to the Manitoba Marathon in Winnipeg and I’ve been able to quickly jump back into training after Fargo. 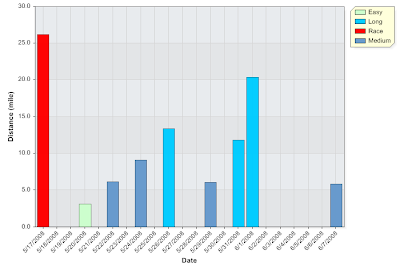 As you can see from my training graph I did a reverse taper for two weeks hitting another 20 mile training run. I’m now tapering down until the race. Well, taper is to mild of a word. I didn’t run at all during the week last week due to work and stormy weather. But this weekend is beautiful and I’m getting in my weekend runs. 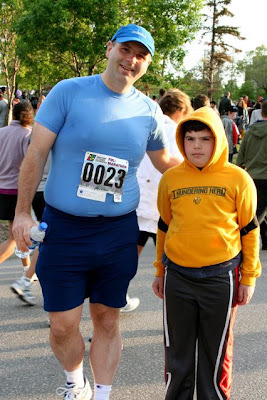 I’ll do a little more running during the week, easy 4 milers I think, and then give it my best on Father’s day.